This parmesan and asparagus breakfast souffle is an elegant but easy way to serve up eggs and asparagus. 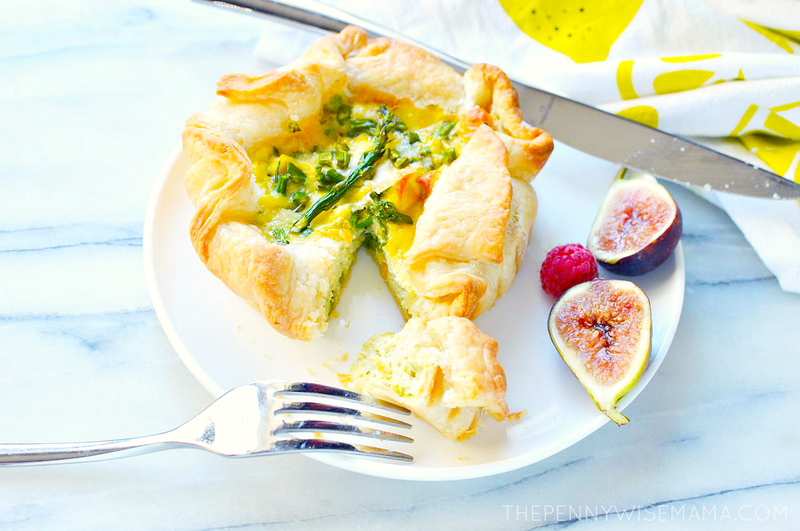 A tender and light puff pastry is filled with fresh asparagus, creamy egg base, parmesan, and seasoning and then baked to perfection. Don’t be intimidated by the word souffle — this recipe is easy to follow, and before you know it, you will have one outstanding and savory dish to serve up. To be honest, I have made a few souffle in my day, and they let me down in the flavor department. I worked through a few recipes and finally created this parmesan and asparagus souffle. I’m happy to say it worked out fabulously! The tender asparagus next to the light and flaky puff pastry is amazing, and the parmesan is a nice accent. 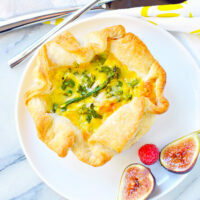 It’s perfect for a weekend breakfast or brunch! If you have never had a souffle, they are outstanding. My first one was in a restaurant years ago, and I have always ordered them on special occasions since. Souffles are light and airy, and they honestly melt in your mouth. The asparagus has an earthy and green flavor that gets combined in, and the parmesan adds a little zing in the endnotes. Read on to get the recipe below! You can prep some of the work to making a souffle ahead of time, but serving it later is a no. 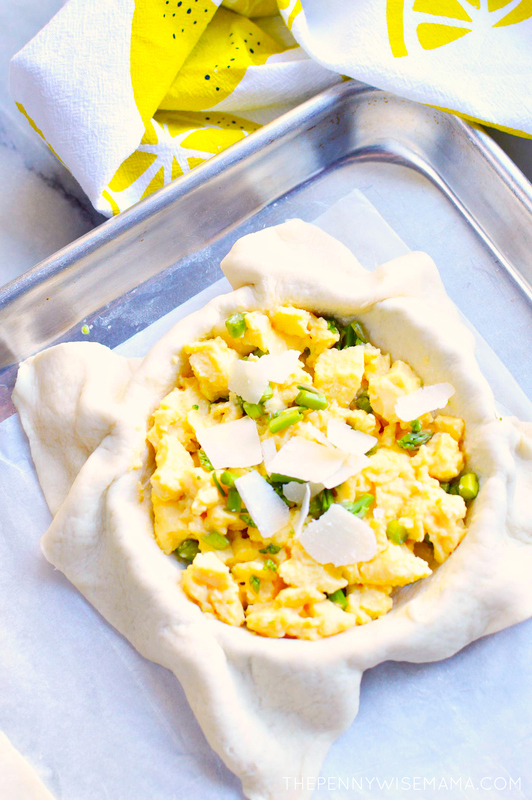 You can whip up the eggs and such and let it sit for up to 30 minutes before you bake, or prep your containers with the puff pastry. But once you pull your asparagus out of the oven, it needs to be served. Souffle is best served straight from the oven. If you do have leftovers, you can place in the fridge for 2-3 days. If you want to reheat a souffle, note it will not rise like it did in the oven. The flavor will vary as well as the texture. The best way to store your souffle is to allow it to cool a bit and then wrap up in plastic wrap or aluminum foil. Refrigerate for up to two to three days. Or if you want, you can freeze for up to one month. To reheat souffle, place in oven or microwave. If frozen, allow thawing in the fridge before reheating. Souffles can be made in a handful of dishes successfully. I will share some of them with you below. 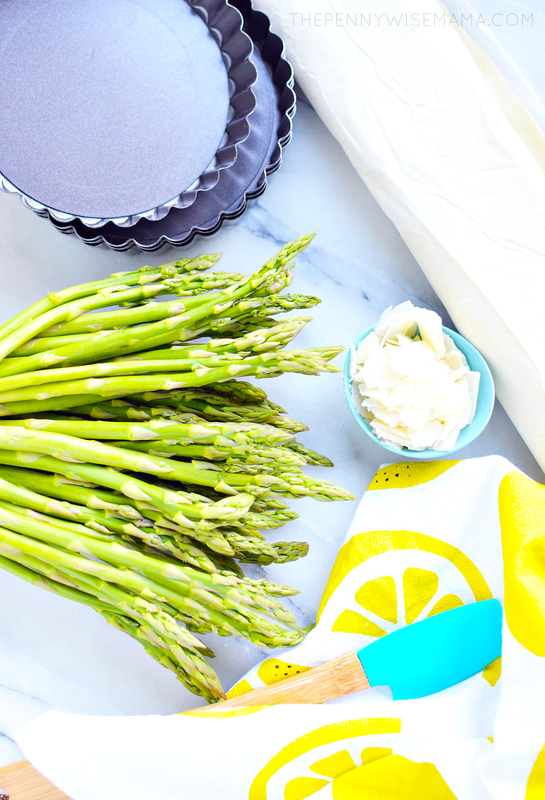 I used a tartlet pan for this parmesan and asparagus souffle recipe. Whether you want a single serve asparagus souffle, or make a casserole dish to slice and serve a crowd, these are all great options. The one struggle of a souffle is it doesn’t last long! If you want a gorgeous presentation, try to have it served within minutes of pulling it from the oven. After that, you will find it begins to get stale and can flatten. Like noted above, you can save leftover souffle if you would like, but it will change in texture when reheated. This parmesan and asparagus breakfast souffle recipe is an elegant but easy way to serve up asparagus. 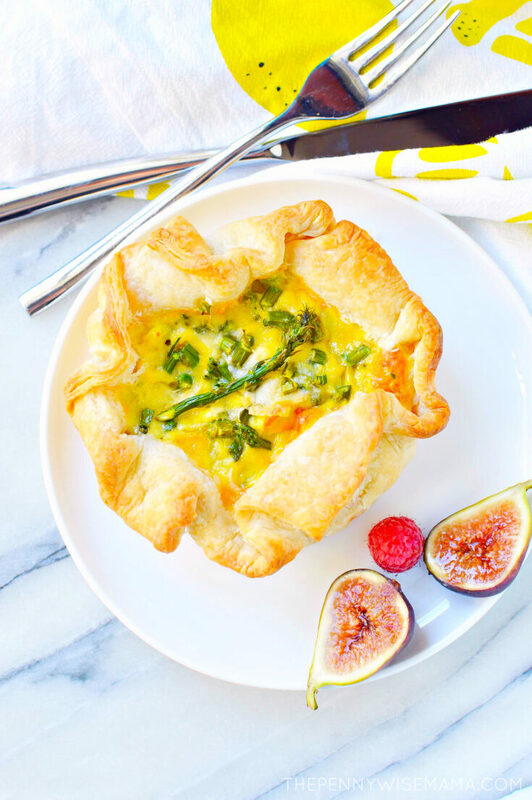 A tender and light puff pastry filled with fresh asparagus, creamy egg base, parmesan, and seasoning that is baked to perfection. 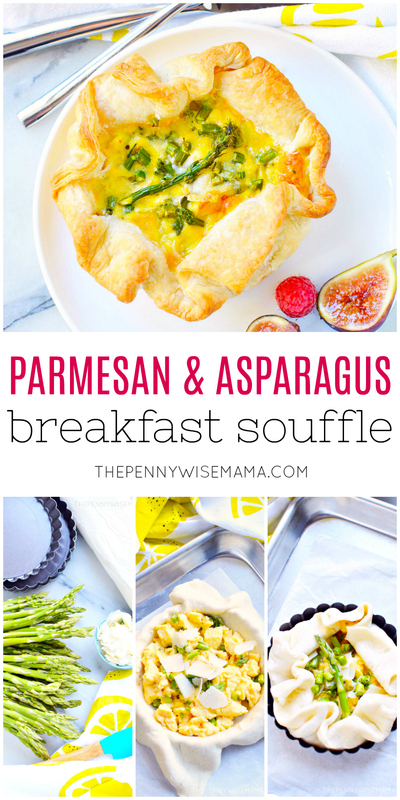 Great for a weekend breakfast or brunch! 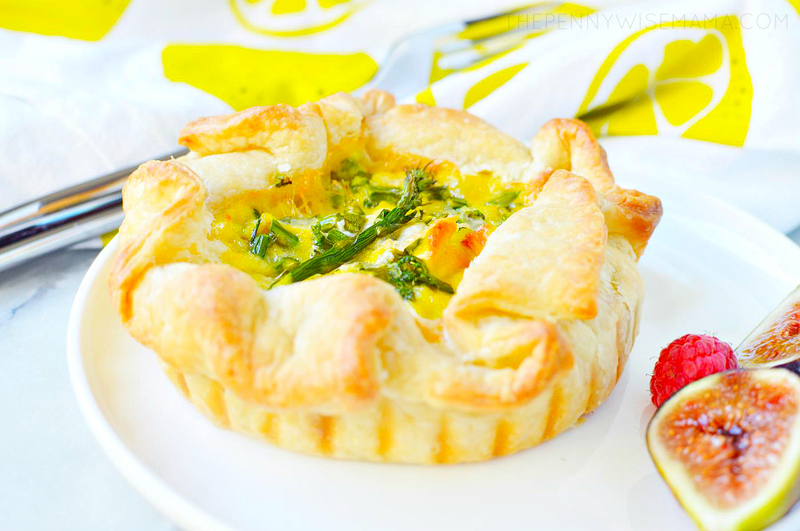 Spray the entire inside of each of the four tartlet pans with the nonstick spray and preheat the oven to 400 degrees. Set one of the pastry sheet pieces into each of the four tart pans, carefully pressing to ensure the bottom of the pan is lined with the pastry instead of just being draped over the pan. Lay in a little bit of parmesan and asparagus into the bottom of each, reserving more of the fillings for the top. Whisk together the eggs, milk, salt & pepper then microwave for 30 seconds at a time for 4 to 5 times, stopping after each 30-second increment to whisk everything together. The mixture will start to cook and thicken, this will allow you to divide and transfer the egg filling and then fold the pastry over the top without the pastry dough falling into the liquid eggs and getting soggy. 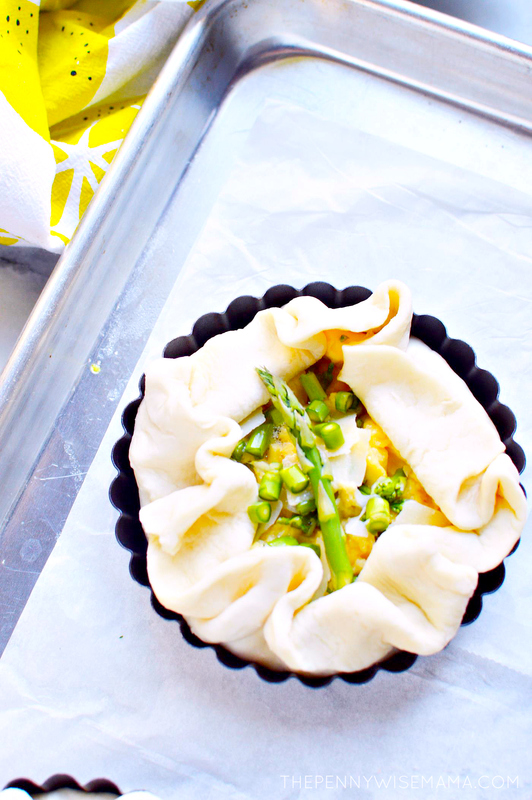 Divide the partially cooked eggs into the four tartlet pans and then top with more of the asparagus and cheese. Fold the pastry dough over the filling and press down just a little bit. Bake for about 25 to 30 minutes or until the pastry is fully puffed, golden brown and the eggs have nicely puffed up into a soufflé. Remove from the oven and allow them to cool for a little bit before removing from the small tart pans. We enjoyed these right away but they the rest were tasty the next day as well. Have you ever tried a parmesan and asparagus souffle?